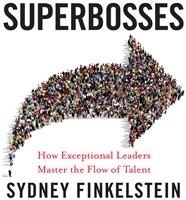 Join us on February 24th at the Pyramid Club to hear Sydney Finkelstein, author of Why Smart Executives Fail, discuss SuperBosses, How Exceptional Leaders Master the Flow of Talent. Sydney Finkelstein, author of Why Smart Executives Fail, and the Steven Roth Professor of Management at the Tuck School of Business at Dartmouth College, looks at how a select few visionaries develop the most successful talent in every industry. Imagine a world where the work you did really mattered. Where the person who you call your boss changed your life by helping you accomplish more than you ever thought possible. Where your own opportunities would multiply in ways you may have been afraid to even dream of. That’s the world his new book is about, the world of SuperBosses and the incredible yet often disarmingly simple things they do to make all this happen. Heavy Hors D'oeuvres will be served. Cash bar.